After Dyrrhachium, Julius Caesar pulled back to regroup his army. Gnaeus Pompey failed to follow up his victory and pursued slowly. After a winter of maneuvering through Thessaly, Pompey encamped at the foot of the mountains near Pharsalus and was persuaded by the senators in his camp to settle the issue with Caesar once and for all. Pompey had a numerically superior but inexperienced force. Caesar’s army was much smaller, but still composed of crack, veteran legions. 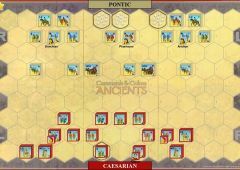 Pompey’s plan took into account his strength in cavalry and called for it to out-flank Caesar’s right. 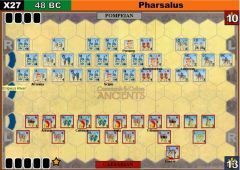 Caesar saw what Pompey planned and formed a line of legionary veterans in reserve to counter any out-flanking maneuver. As the fighting began, Pompey’s cavalry charge rolled over Caesar’s horse. However, when confronted by Caesar’s reserve, this mounted force was thrown back in turn by legionaries using their pila as spears. 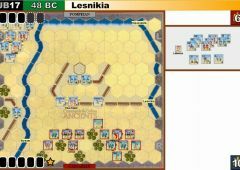 The Caesarian legionaries who routed the Pompeian cavalry now turned their attention to the exposed left flank of the Pompeian infantry line, pushing back some of Pompey’s better legions stationed there. 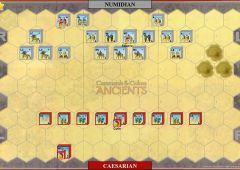 Caesar’s legions in the center and on the left now began moving forward. Pompey’s foot units were ordered to hold their ground. 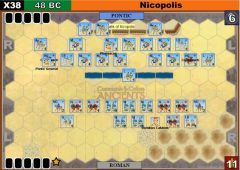 Normal battlefield tactics would find both sides advancing to the attack but Pompey’s troops did not advance, hoping Caesar’s infantry would tire themselves out in a long charge. 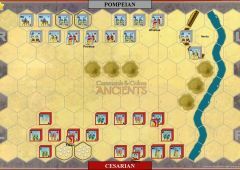 Instead, Caesar’s more experienced legions just halted within a few yards of Pompey’s line, reformed and then made a headlong attack. 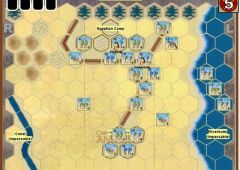 With his cavalry defeated, his left flank turned and the center and right hard pressed, Pompey fled back to camp, leaving his army to disintegrate. 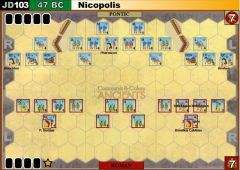 Most of the survivors surrendered to Caesar the next day. 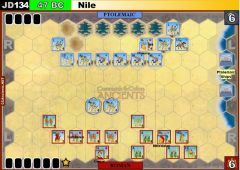 Pompey fled to Egypt, where he was assassinated by Ptolemy XIII. 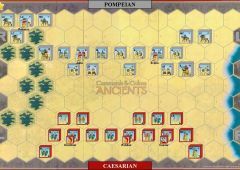 Caesar was now clearly ascendant, but mopping up the remaining Pompeians would still require much hard fighting in the east, Africa, and Spain. • All hill terrain hexes are impassable. 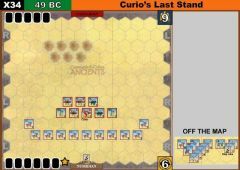 We played twice switching sides and it was two Caesar victories, 3-7 and 2-7. 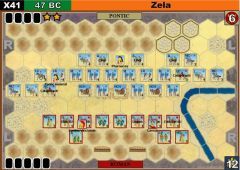 In the first battle Caesar got two line commands and moved the heavy units to get the center. 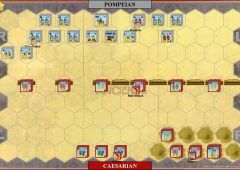 Pompey did not move his cavalry and the other flank was destroyed for both sides, leaving the battle for the center, where Caesar himself helped win the day. On the second battle the situation was similar but there was an indecisive cavalry fight. 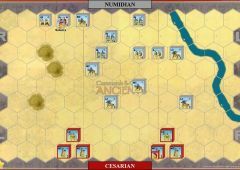 Both sides retreated their broken units and in the fight for the center Caesar again prevailed. Caesar seems much stronger in this battle though there are a lot of shattered units for both sides that do not count as banners and do not reflect in the final results. This time Caesar did not get a line command out early. He attacked ad hoc doing some damage. 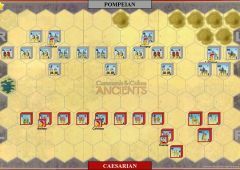 However, a Clash of Shields allowed the Pompeian forces to push him back down the line. Caesar lost his heavy unit but was able to attach to medium unit. 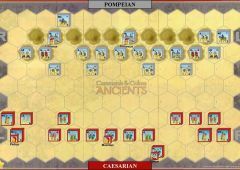 Pompey had moved his archers this time out of harms way, which deprived Caesar of some easy kills. 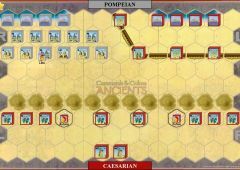 Pompey looked like he had Caesar, but at the last few turns he ran out of steam, and Caesar won 7-6. An exciting battle this time. 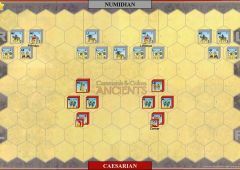 Caesar played line command and moved forward unhurt by Pompey's archers. He then hit the enemy troops like a freight train. 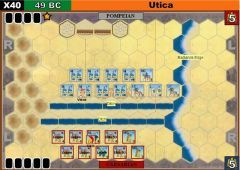 Caesar's troops did get seperated leaving gaps for Pompey to take advantage of. 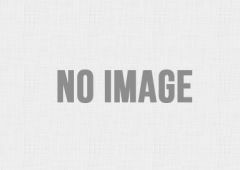 Caesar lost a general and several heavy troops including the the one he was directy. 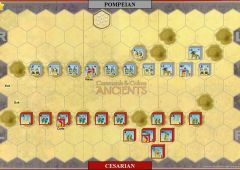 However, Pompey also lost a general and had few options. 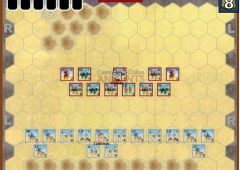 A calvary charge by Pompey was attempting to knock Caesar out, but they were crushed by Caesar's counter charge. caesar won 7 to 4.